I read David Bowie's first recording found in bread bin, set to sell for £10,000 yesterday. The seller says, "Our agent, Eric Easton, who also managed the Rolling Stones, asked us to do a demo so he could try and get us an audition at Decca. "So in early 1963 I booked into RG Jones' small studio in Morden. In preparation for the demo, David and our guitarist Neville Wills wrote two to three songs." Intrigued by Morden being round the corner I looked RG Jones up - http://rgjones.co.uk. The Rolling Stones, Tom Jones, Yardbirds, Eric Clapton, David Bowie, Springfields, Englebert Humperdink and The Bee Gees all recorder in Morden as well. Then in 1968 RG decided to move the legendary studio to Central Wimbledon and the building in Morden was destroyed to make way for Merton College. I think in RG I have discovered a new Welsh Born Icon. Ronald Geoffrey Jones was born in Caerphilly in South Wales. From an early age he loved designing and building gadgets. Entirely self-taught, he was equally skilled at carpentry and metalwork and was very quickly able to construct a power amplifier and other pieces of electronic equipment. Known as Geoff, Reg or RG, his first job on leaving school was for a company called Milton. He became a salesman for the company and from a caravan, in which he also lived, he sold his wares in town markets all around Wales. Getting himself heard above the other market traders was hard work and he soon began to turn his mind again to electronically amplified sound. Totally undaunted by his lack of training in electronics, he procured all the necessary components and had soon assembled a system. 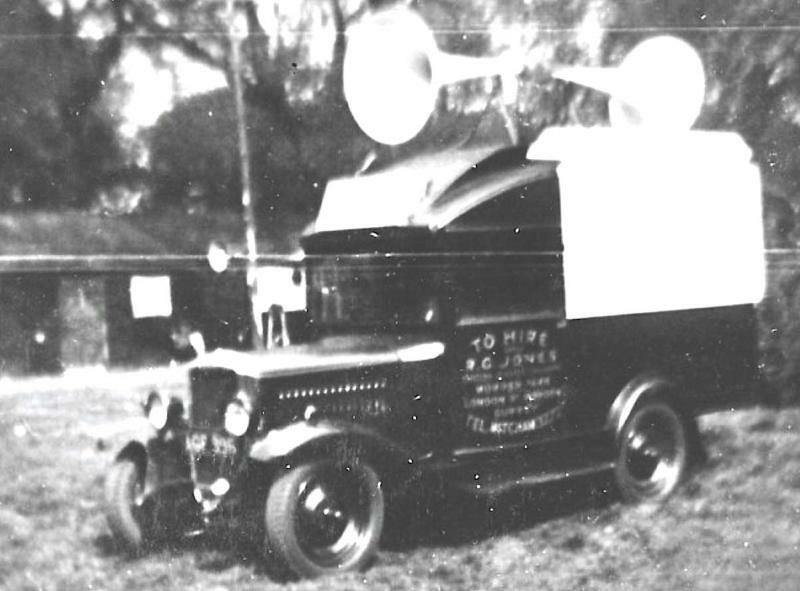 Two large horn loudspeakers, the flares constructed entirely by him out of bits of timber, were mounted on top of the car which towed his caravan. Inside, he installed a microphone connected to an amplifier powered by four twelve volt batteries and a rotary (48V to 230V) convertor. It worked! The young RG Jones was now able to advertise himself effortlessly to the crowds giving him a distinct advantage over the other retailers. Such was the success of his enterprise that his employers asked him to build a further fifteen more systems to equip the rest of the Milton force. So by the tender age of just eighteen, the same year Queen Elizabeth II was born, with the BBC just barely formed and Stalin just in power, the young RG Jones went into business for himself.